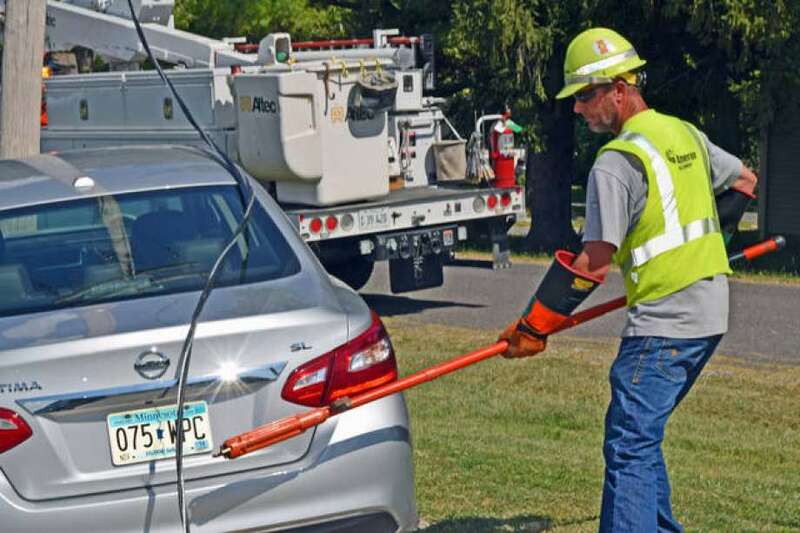 CAROLINA - Ameren Illinois and Safe Electricity are urging the public to stay in their cars and call 911 in the event of an accident involving a power pole that brings down power lines on or around the car. In a media simulation Tuesday at the Ameren facility on West Lafayette Avenue, Ameren Illinois employees demonstrated the proper way to react if a power line has fallen on or around a vehicle. Although the situation might seem rare, Illinois motorists alone hit 3,000 power poles each year, said Krista Lisser, communications director for Safe Energy. “We want to get the word out that, if you hit a utility pole and a live wire falls on your vehicle, stay in your car,” Lisser said. “Our first reaction is we panic and think we need to get out. That’s not the case, you need to stay in because, when that live wire comes down, electricity is all around you. You may not see it, it may not arc, it may not flash, you may not know if there’s electricity there. Should someoneinvolved in such an accident see a good Samaritan attempting to help, he should try to tell the would-be rescuer to stay back to prevent injury to the Samaritan, Ameren Illinois Communications Executive Brian Bretsch said. The only instance in which one should exit a car in the vicinity of a downed wire is if the vehicle is on fire and there is no choice but to exit. In that situation, those in the car should “bunny hop” out of the car by jumping from the car without touching the car and the ground at the same time, Bretsch and Lisser said. After the initial jump, those escaping the vehicle should continue jumping with both feet together and hands tucked in and away from danger until they are safely clear of the downed wire. It’s important for everyone to be informed, because an encounter with a live wire could easily result in serious injury or death, Lisser said.